The Martian screenwriter and former Daredevil showrunner Drew Goddard is getting a tune up before heading into the X-Force movie. Goddard is writing and directing Bad Times at the El Royale, a ‘60s period thriller that will take viewers back to one blood-soaked night at a rundown hotel crossing into five different states. The first trailer has arrived, and it offers a glimpse of Goddard’s powerhouse cast, which includes Chris Hemsworth, Jeff Bridges, Dakota Johnson, and Jon Hamm. Most of the trailer follows Bridges’ Father Daniel Flynn, a priest who has fallen on hard times. And if the footage is any indication, Father Daniel may not even be a real priest. A young singer played by Cynthia Erivo is also thrust into the spotlight as she steps into a bad situation at the very worst possible time. Johnson is playing a criminal who has literally roped up her sister, as played by Cailee Spaeny; while Hamm is portraying a vacuum cleaner salesman who doesn’t seem to know when he should stop talking. Hemsworth is playing a “charismatic cult leader,” and the trailer presents him as the biggest threat to his fellow “guests.” But there is also a hint that the hotel is more than it seems, as each room is designed to hide a secret passageway where the guests can be spied upon. “Management” apparently dictates who is watched and who isn’t, and the secrets of the guests are about to be revealed. 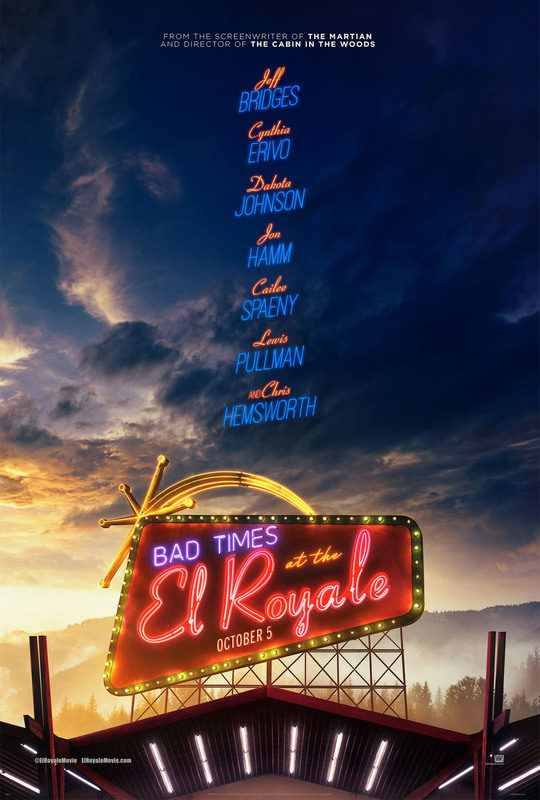 Lewis Pullman, Nick Offerman, and Mark O'Brien round out the cast of Bad Times at the El Royale. It will hit theaters on Friday, October 5. What do you think about this trailer? Let’s discuss in the comment section below! See Matthew McConaughey and Anne Hathaway in the Serenity trailer. Our review of Ocean's 8. The first trailer for How to Train Your Dragon 3.